Mesmerizing - Pure Oscar Material! 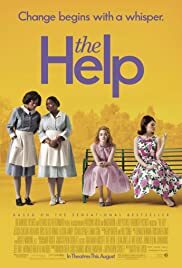 Oscar Oscar Oscar – Kathryn Stockett's beautiful book is Oscar worthy in this film -- for editing, screenplay, supporting actress (several deserving) – Emma Stone just shines – at just 22 years old, this film proves she is a force to be reckoned with in Hollywood. There are so few roles written for black women and I was thrilled to see such great roles filled by Viola Davis (Abigail) and Octavia Spencer (Minnie) - both should be nominated for supporting roles although in my opinion, along with Emma Stone, all three share top billing. This movie sets out beautifully a terrible time in our history that unfortunately is not over – it is better, but not over by a long shot. Being a child of the south and coming up during that time, being raised by such bigoted grandparents and parents, it leaves me pause to wonder how I avoided this rabid virus of hate and takes me back to long hot lazy days in the deep south before every building was air conditioned – such attention detail right down to the Jesus fans they waved in church – awesome flick. You FEEL the heat, the tension, the pain, the injustice of the time but still you laugh with them even as you cry for them - both races - ignorance is to be wept over. However, I think this movie does more, goes further in its exploration of the behavior of the privileged during that time. They were rabid toward blacks but were not that much better toward anyone who did not share their socio-economic status (the way the "Junior League" treated Celia) and the enormous peer pressure they put on one another (the club encouraging Skeeter's mother to make a poor decision). It visits the sins of the parents passed on to their children – the bigotry and injustice that is learned at the knee of our elders. OMG it is just an awesome, poignant, moving, NOT TO BE MISSED film.